Figuring out how to comfortably and safely carry stuff on your bike can greatly improve your riding experience. In this shop tip we’ll look at the pros and cons of various commute-friendly ways to carry stuff while riding your bike. This is the easiest and most affordable way to carry stuff while riding a bike. Pick a bag that’s appropriate for your climate and carrying needs. Messenger bags are usually pretty good in the rain and much easier to get stuff in and out without taking the bag off. For heavy loads, I find the single shoulder strap uncomfortable. Backpacks distribute the weight a little better, but are harder to access while wearing them. 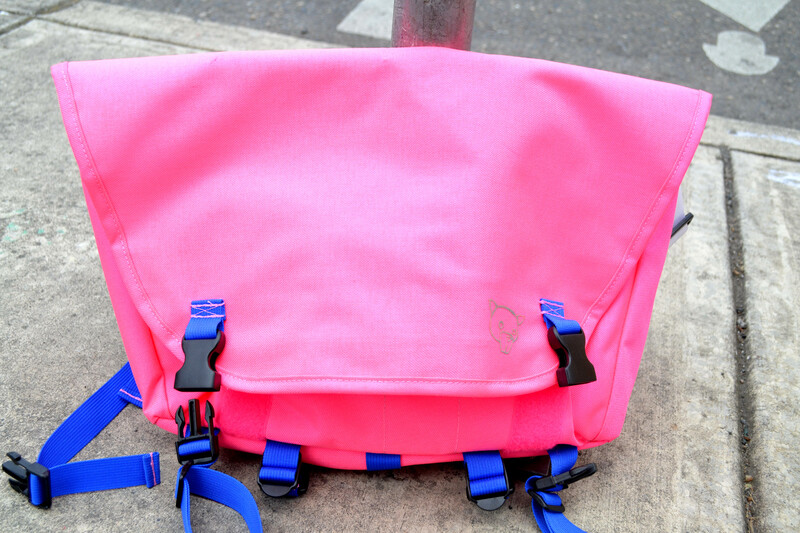 We carry locally made waterproof bags from North St., Black Star Bags, and Blaq Bags starting at $166. Pros – Potentially an inexpensive, easy, accessible option for most people. Cons – Potentially uncomfortable and will lead to a sweaty back. Front basket/platform rack – I find a front basket or platform rack to be the most versatile way to carry stuff around town. We carry two different sizes of Wald baskets for $20 each, but there are lots of options. Front wheels are inherently stronger than rear wheels and can handle more weight. Front loads will affect handling, but the learning curve is brief. Front baskets are great all over town from long commutes to quick errands. Pros – You can use any bag you want (messenger bags work great with baskets) or no bag at all. If you make an unexpected stop you can wear your normal bag and then load up the basket. It’s really fast and easy to get things in and out of a front basket. I’ve even been able to change layers waiting at a stop light. You can also see everything you’re carrying and will know if something shifts around or falls out. Simple front baskets from Wald are pretty inexpensive. 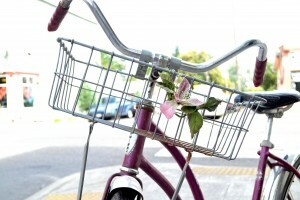 Cons – Your bike will handle differently with weight in the basket than without. Most front baskets or racks will not work with a suspension fork. Juggling the bike at the rack can be a little tricky with a big front basket. 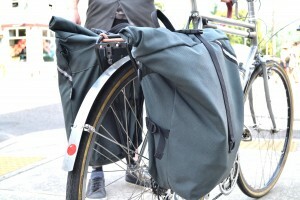 Panniers – The most popular compliment to a rear rack are panniers, those bags that hang off the sides of the rack. There are endless options of size and style. We stock basic panniers from Axiom starting at $44 a pair, waterproof single panniers from North St. starting at $75, and fancy waterproof Ortlieb panniers for $180 a pair, with many options in between. The most versatile pannier is the North St. Woodward Convertible that works as both a backpack and a pannier for $250. Panniers are better for commuting than quick errands, but will do both well. I think they are at their best on a bike camping trip. Side baskets – Sunlite makes foldable side wire baskets to mount to a rear rack for $24 per side. These folding baskets offer a lot of the same benefits of the front basket, such as using any bag you want and increasing your carrying capacity by wearing said bag. They tend to rattle and can be a little heavy. They’re about the size of a paper or reusable grocery bag, making them great for errands. Top mounted basket or crate – Mounting a milk crate to the top of a rack is a quick and cheap way to increase carrying capacity. Like a front or rear side basket, you can use any bag you want. This tends to keep weight up pretty high, which can affect handling, and can make it hard to get on and off the bike. 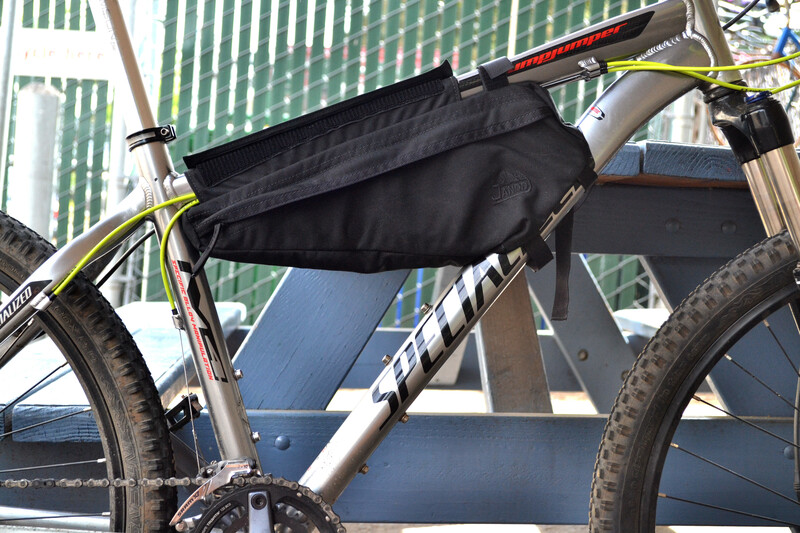 Saddle bag or frame bag – Two rackless bag options. Various companies make under seat bags big enough to carry your commuting needs. Big seat bags are not that quick to take on and off, so are best suited for commutes with secure parking on either side. Frame bags — such as the one pictured from Jandd for $36 — can hold a surprising amount of stuff, and are easy to access while on the bike. There are many more ways to carry stuff on a bike, but these tend to be the most popular for carrying stuff around town. My personal favorite is the front basket or rack with a waterproof backpack. It’s quick to get things in and out, and if I need to carry more I can always wear the backpack. No matter what system you use, just remember that anything left on the bike while it’s locked up might get stolen. If you want more opinions or would like to see what all the various ways you can carry stuff on a bike, come by the shop and speak to our friendly mechanics.